One night for dinner my sister made panko-crusted chicken fingers and we had to get some honey mustard for it. I know it sounds lame but just mixing honey and mustard together never tastes the same as bottled stuff and we felt that trying two jarred honey m’s that are in the refrigerated section would be a good pair to evaluate. 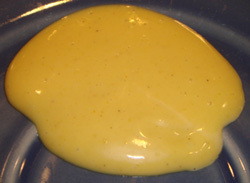 This is a lighter colored honey mustard and has a creamy texture and taste. In fact it’s so creamy you might not recognize it as honey mustard but there was something about this that was addictive. Elaine described this as a perfect balance of honey, mustard and creaminess. She also really liked this because it reminds her of the honey mustard they used to serve at Houlihan’s, who had their problems with food but did have a good honey mustard. Zac, my brother-in-law also thought this was good and I couldn’t get any more adjectives out of him. Clearly, Marie’s was much more mustardy looking with it’s deep yellow color. 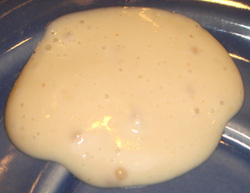 This was not as creamy, yet had a slight creaminess and richness that is not found in most honey mustards. Elaine describes this as slightly creamy mustard. Zac agreed this had a stronger mustard flavor and as he was eating this he said the taste was winning him over. While Elaine and I appreciated Marie’s we preferred the Lighthouse version. This is something just SO good about it, a great balance of ingredients and it’s creamy taste. Marie’s ended up claiming Zac’s tastebuds and he would choose it over Lighthouse because of the stronger mustard taste. 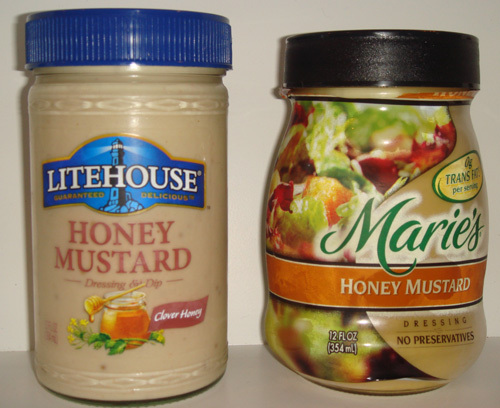 We did find it interesting that mustard came before honey on the Lighthouse ingredient list and honey came before mustard on Marie’s even though the opposite had a stronger taste. So basically if you like a little more mustardy taste, go with Marie’s but I really think there is something about lighthouse that make it a little more special.